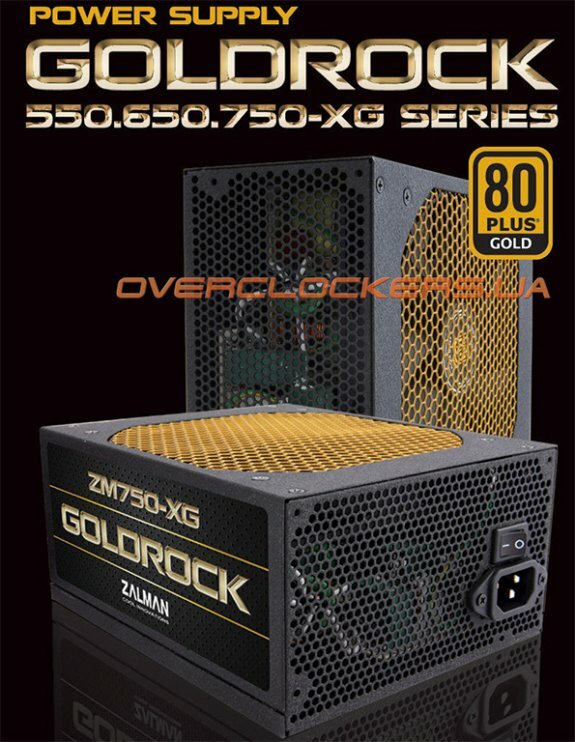 TPU came across details of Zalman's upcoming Goldrock, a new line of power supplies with 80Plus Gold efficiency rating. To be available in 550W, 650W and 750W editions, these units will deliver an efficiency of at least 87 to 92 percent at 20 to 100 percent load. More info and photos over here. The Goldrock series PSUs from Zalman pack high-grade Japanese capacitors, active PFC, LLC resonant circuit, DC-DC switching. A single +12V rail design is implemented, which can deliver 45A of current on the 550W variant, 54A on the 650W, and 62A on the 750W variants. A 5VSB green IC gives the PSU ErP Lot 6 compliance. A secondary protection IC gives it protection against over/under voltage/current, overload, and short-circuit. The 550W, 650W, and 750W variants are expected to be priced at US $134, $145, and $158, respectively.